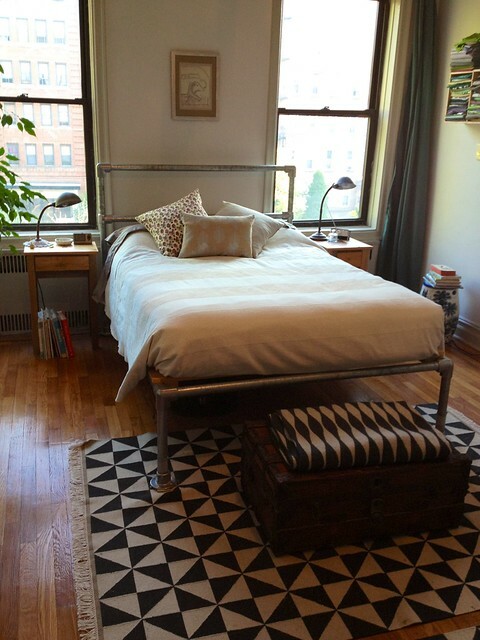 Heather from NYC built this modern pipe bed frame made of Kee Klamp pipe fittings and pipe. 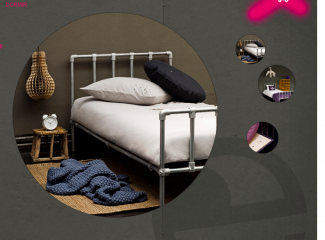 You can see that this combination delivers a clean, modern looking bed frame. She liked the first one so much (pictured here) that she's already built a second one in her weekend home. 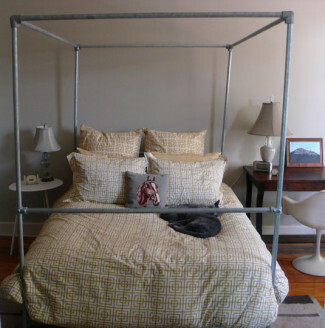 Below are the steps required to build your own pipe bed frame. 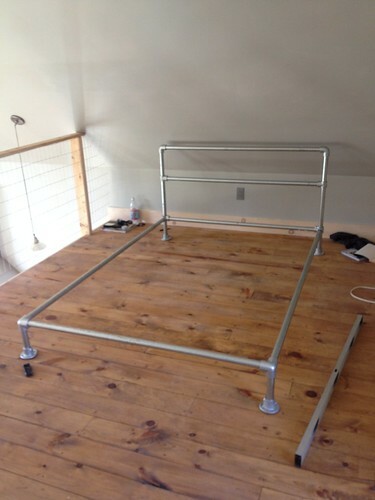 It's easy to do, and if you get your pipe cut ahead of time you can probably assemble this bed in a matter of hours! 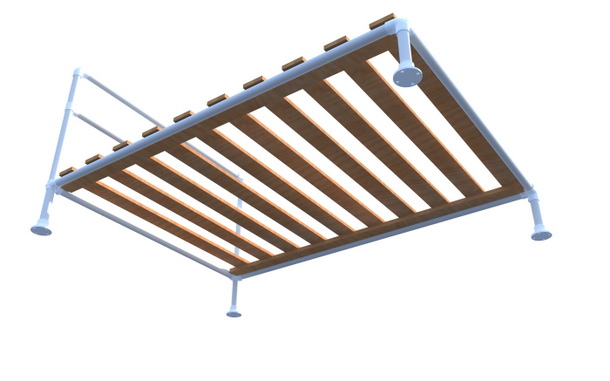 To make this project more interesting, I've included a sketchup file of the pipe bed frame here. 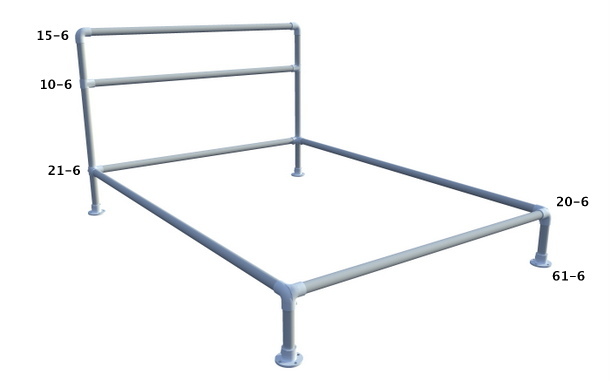 You can use this file to see the pipe bed frame from any angle, or possibly even manipulate the file to create your own unique bed platform. This design will work well for a twin and full size mattress. If you want to build the frame for a larger mattress, no problem, just add an additional support down the middle of the frame. Cost is always a question that comes up. 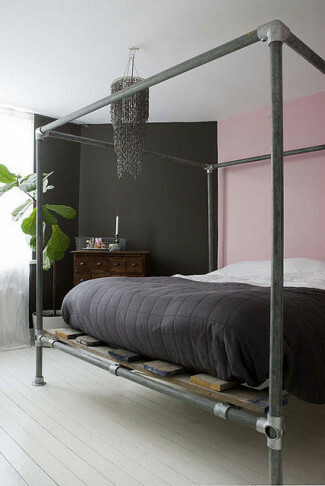 To build this bed frame as pictured using all store bought materials would be around $300. The biggest factors are, what kind of pipe, what kind of wood. If you got recycled pipe and lumber you could do it for around $120! So the price is really dependant upon your selection of materials. The only fixed cost for this project is the fittings. 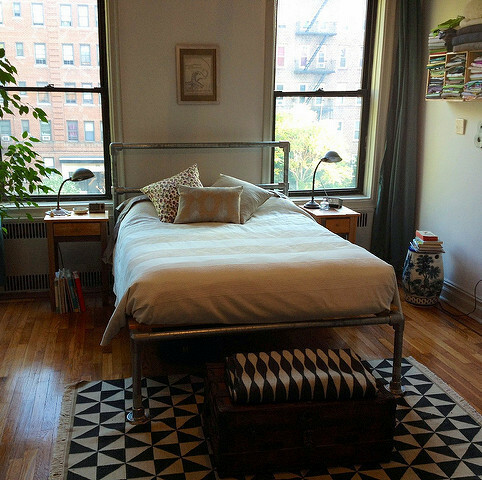 The size of your mattress will determine how long the pipes of your bed frame need to be. So before purchasing, be sure to consider the dimensions of your mattress. You probably want your pipes to be just a little larger (but not too much) than the edges of your mattress. 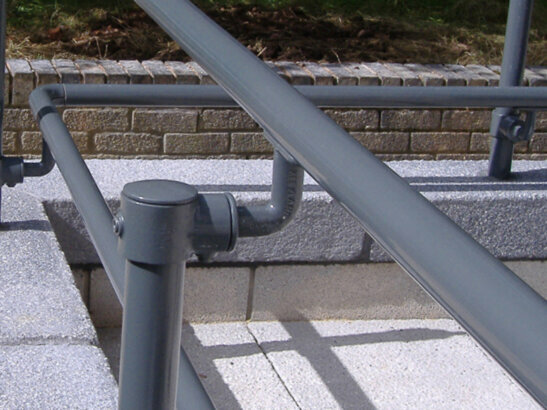 The pipe fittings will give you an additional inch or two around the edge, so take that into consideration. 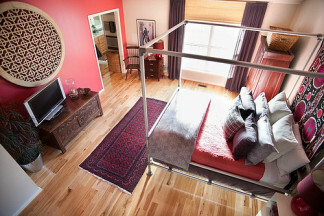 The bed legs can be any height your heart desires. You can buy the pipe pre-cut from us, or you can usually find it at a local plumbing supply or homestore (it's cost versus convenience). You can get all the fittings required for this project right here on Simplified Building. See Click here for a short video on how the fittings are used. 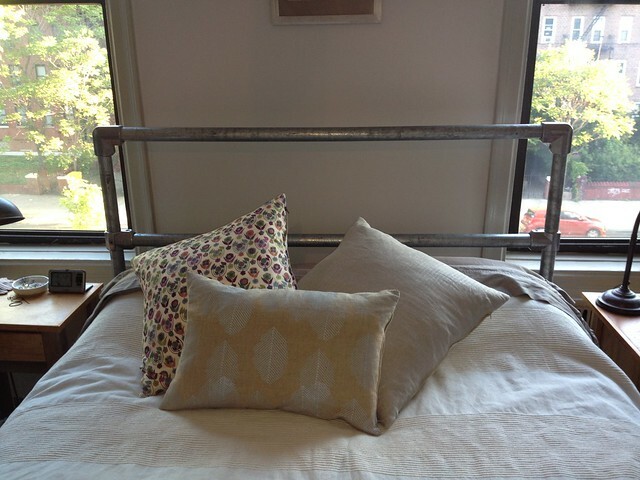 You can see that Heather also added felt sliders to the bottom of the 61-6 flanges to make the bed frame eaiser to move and less likely to scratch the floor. 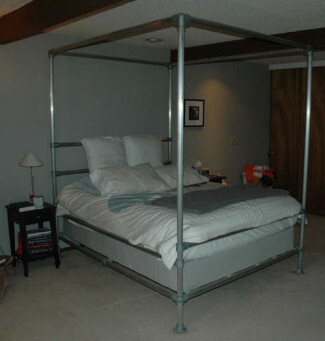 As you can see from this photo, the assembly of the pipe frame for the bed is pretty straight forward. 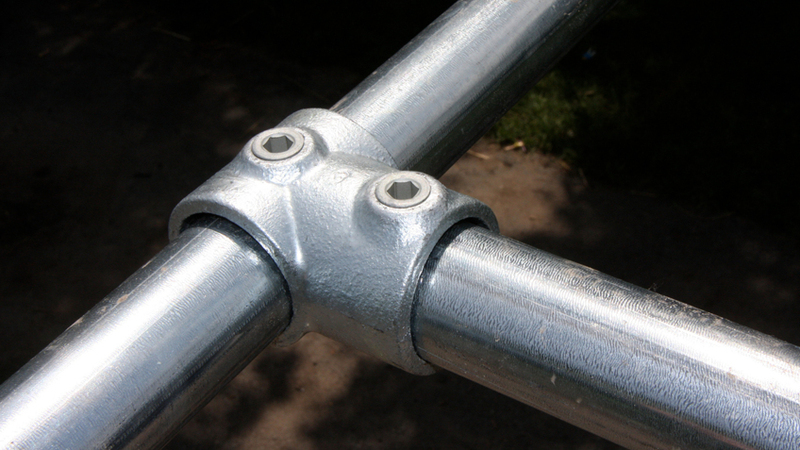 Slip the fittings onto the pipe and tighten them down a the desired location on the pipe. 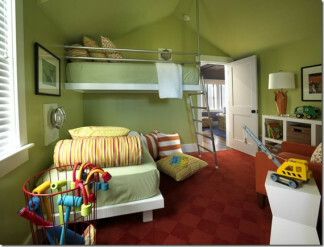 A tape measure and a level will come in handy to make sure that everything is tightened down in the right location. 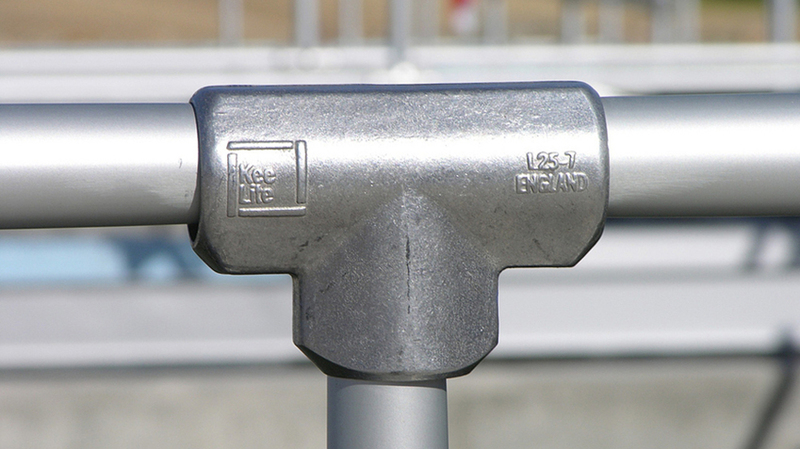 If you make a mistake, no problem, simply loosen the set screw and re-tighten in the right location. Working with Kee Klamp pipe fittings is very forgiving and you'll find no problem adjusting the bed frame even after it is mostly assembled. 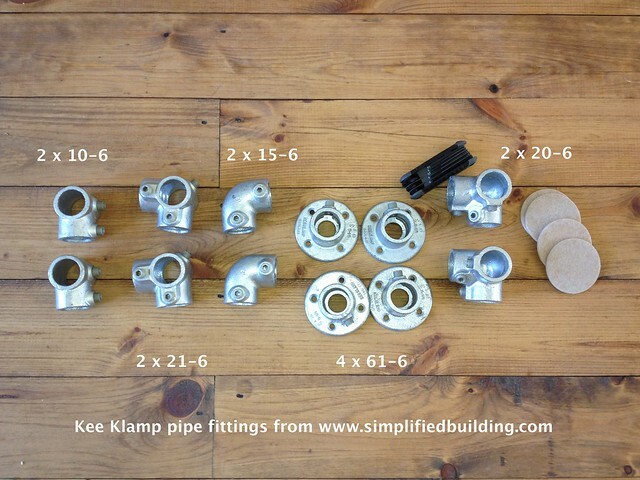 The fittings have been labeled in the image above to help you know which Kee Klamp pipe fittings are placed where. This part of the project can be as simple or complex as you like. 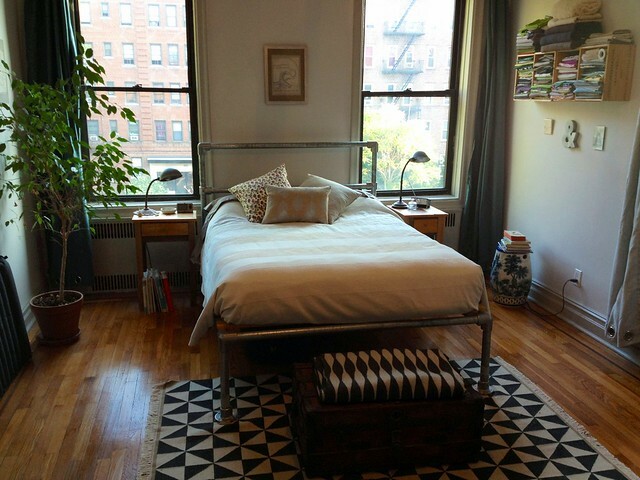 Heather used 1" x 4" lumber to support her mattress. You can build something like what is pictured above by screwing together 1" x 4" boards. Reinforcing the lumber will make the bed frame stiffer and may be required if you are building a bed frame for a Queen or King sized mattress. 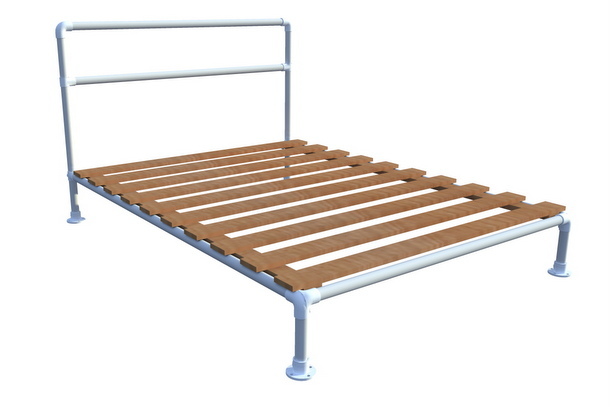 Depending on your budget and look, this wood bed frame base could be made of special types of wood or be stained or painted. Have a good night sleep on your new pipe bed! You worked hard on this project, so enjoy the fruit of your labor. 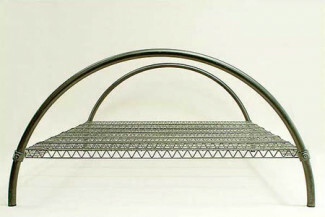 If you're interested in this design, or building anything with Kee Klamp and pipe, our design team can help. Get in touch with them here and they will be happy to help you on your next project.